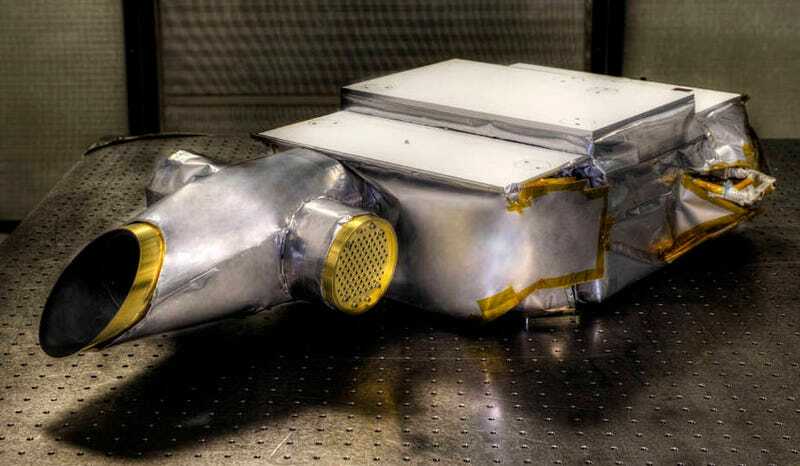 It may look like a cross between a mylar balloon, a suitcase, and an old-school gas mask, but it’s actually a highly sophisticated sensing instrument. And it’s going to tell us whether there’s water on an asteroid or not. This is NASA’s OSIRIS-REx Visible and Infrared Spectrometer (OVIRS) and it’s going to be part of our very first trip to bring a little something back from an asteroid. Though the OSIRIS-REx mission to Asteroid Bennu will be collecting samples, OVIRS will actually do its work by breaking down the light coming off of the asteroid. If it spots the right wavelength, that will mean that there is indeed water up there, as some scientists suspect. The trip to Bennu isn’t slated to launch until 2016, then it’ll take it two years to reach the asteroid, and it won’t be making its way back to us until a full seven years later in 2023. When it does though, it should have something interesting to tell us. Sail on, shiny space suitcase!